How many photos and posts of the Guillamenes have you seen here on loneswimmer.com? If you are a regular visitor that is. Quite a few. (You should see the hundred of pictures in my photo library that haven’t made it here but which I still keep taking). How many of you from around the world know about the Guillamene because I write about it regularly? I have spent hours, days, weeks cumulatively, there over the last seven years. I’ve met people there from all the world who accidentally find our little treasure, while others visit specifically and many are repeat visitors to this gateway to the Copper Coast. I always tell people Tramore Bay from the Guillamenes is a great open water swimming location, (and one I have almost to myself). It can be swum in the prevailing south-westerly winds. 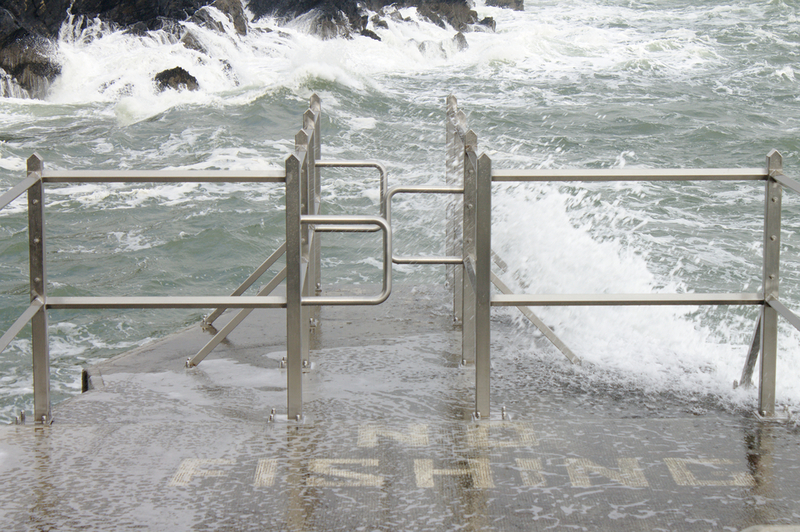 It can be swum at all tides, which isn’t possible even for Sandycove. The water is clear, clean and cold and the scenery is gorgeous. There’s the local and active Newtown & Guillamens Swimming Club, who have spent a lot of time and money stewarding the location for the past 80 years and making the place friendly and welcoming. It is in fact a part of local life, and local tradition, for people of all ages. There’s the hugely popular Christmas Swim, the Diving Contest, the Snámh Fada (long swim) and the late-summer water gala. And then Tramore Council became involved more. Now they have always been involved of course, they empty the bins, cut grass, installed public toilets, all useful public services. Of course, that’s the job of councils. After all the Guillamenes and Newtown Coves are themselves tourist locations, in a town whose economy is based primarily on tourism. The club put in a significant amount of money, raised over many years from member’s €20 per annum subscriptions, toward maintaining and improving facilities. The joint venture saw new concrete changing bench/platforms in both coves, the old slipway in Newtown cove repaired, and new wooden picnic tables in the park. All this work was possible because the quite significant money raised by the club, was matched with money from a Euro Leader grant. The building work was a gradual roll-out First came the improvement to Newtown Cove concrete changing platforms, then the slipway, and then the wooden picnic tables (one of which a visitor quickly decided would be a good base for a barbecue . The majority of visitors never knew that the club was funding much of this. That in fact the stewardship of the Cove and amenities was keenly felt by the club members and the regular users of the Guillamenes, as many of the regulars aren’t actually members of the club. I was swimming there myself for some years before I joined the club, which I did because of the great facility there for me as a swimmer. The point is to maintain and even improve the area for everyone, locals and tourists, and not just club members. I put together the Newtown & Guillamene website to promote the area, (though since I don’t have the time to maintain no-one else seems interested). In 2010 the famous diving board snapped because five adult idiots decided they could all bounce on it at the same time. When finally replaced in 2012, (diving boards are expensive and difficult to source) it was in place only 6 weeks before “that summer storm” snapped it off, at a cost to the club of €500. 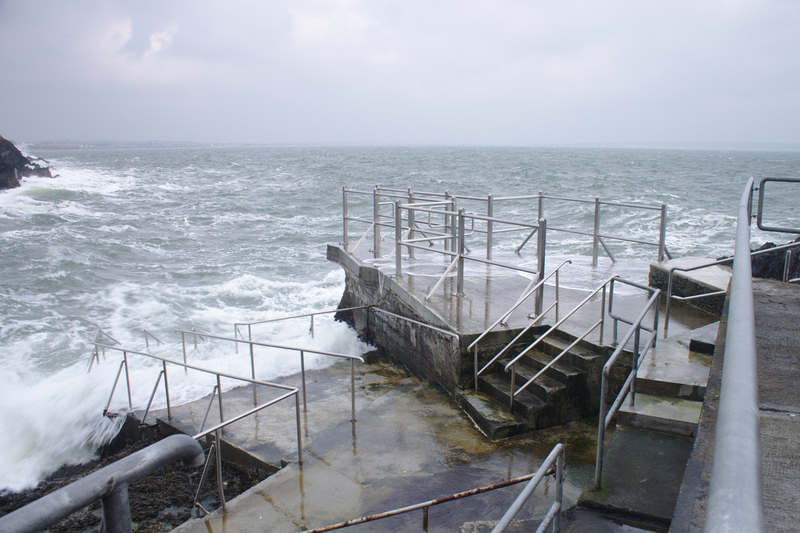 A storm in 2009 ripped the mild steel railings into the water out of the concrete and twisted them like pipe-cleaners. The lower platform and step have to be cleaned of algae every 6 weeks, by club members, a task that takes three people half a day, using a power washer, brushes and scrapers. 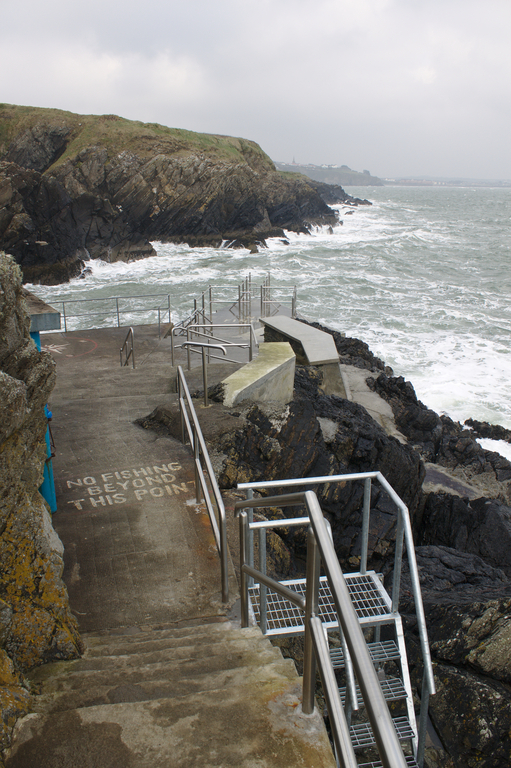 The extensive cliff-top railings had to be repainted annually to protect them from saline corrosion, again a task carried out by club members. The second main stage of the upgrades involved some new railings and ladders in Newtown Cove. They looked fine and were needed for swimmers. But it didn’t stop there. A couple were added to the Guillamene, including the one that looks like a clothes hanger. Marginal utility, not so marginal ugliness. New concrete steps into the water were laid. The first attempt was in late October along with some railing, and some washed away. Genius move. The second concrete was laid smooth, an ideal bed for lethally slippery marine algae. The main steps down to the Guillamene platform were relaid… badly. A platform and second ladder was added for getting into and out of the water. The jury is still out on those. 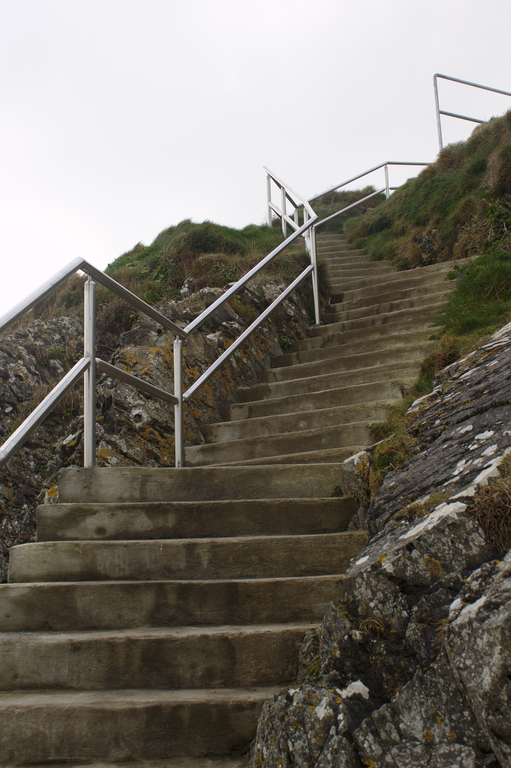 As it was previously, the steps had a bottle neck of a single ladder at low tide. But the new platform is more difficult to climb. But they are acceptable. But then things went bananas. More railings, more railing, more railings. All stainless steel. The old painted mild steel on the cliff top, which due the repainting blended into the locale with well, all replaced with stainless and galvanised steel, the galvanised mild steel up around the car park. Stainless steel of course won’t corrode nor need to be repainted. It is also visually sterile and utterly and completely out-of-place in a location of such natural beauty and of such popularity. The entire effect when you stand there is overwhelmingly ugly, the product of committee thinking, a committee who have no beauty in their collective psyche’s, who don’t understand the concept of personal stewardship and won’t understand the connection with the location all the locals and visitors can tangibly feel. In 2000 I wrote to a national radio station after I’d seen in spring, while surfing, a large mass of sewage floating directly off the beach. The reaction was overwhelming and the lies and diversions by Tramore Council and Waterford County Council at the time were illuminating. They said I couldn’t have been in the water as it was too cold, that the sewage was only dumped further out to sea at half-tide, that there was no possibility of what I’d said actually happening, that new sewage treatment plant was already agreed and under-way None of this was true. Sewage was regularly dumped onto at high tide and easily washed back onto the beach. No-one wanted to address the situation and I was told it was better to lie and cover the situation up. The only option not explored was honesty. In fact it took another eight years before the sewage treatment plant was finally improved. Since 2010 the public toilets in the Guillamenes car park have been locked all year round, & no longer opened during the summer. 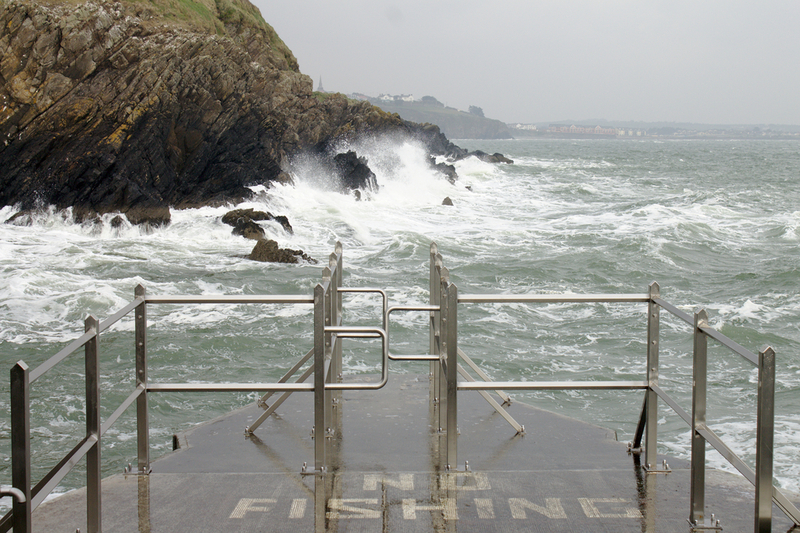 The excuse from Tramore Town Council was they could no longer afford to send someone down to open and close it daily. The Guillamenes is about five minutes drive around the bypass from the Council Offices, such a long way. They can apparently however afford this unnecessary weight of ugly and unnecessary stainless steel, because they can take the funds from the European Union. That is the bureaucratic mind in operation. I can only fervently hope (with little prospect) that one of our south-easterly storms will wash the monstrosity away. All of this will mean little of nothing to almost all of you. But I’ve invited many people to come swim with me, and some have arrived. For those of you who do, you’ll see up close the horrible additions. It seems councils seem to like to ruin the things that people have been doing for years, Take the Diving rocks in Youghal as an example. A quirky little attraction that by god Youghal needs was closed as it was deemed much to dangerous so the council but a big sign up telling people it is closed. You guys are lucky you have such a thing as a diving board!!! A rare commodity in Ireland but those railing are really was too much. Maybe if they were good victorian cast iron or such but not clincial Stainless which is probably crap soucred from China so don’t fear they may not last too long!! mind you then the WCC might just close it off as the remaining steel will be too much of a risk to H&S. Good luck with the fight lads, Must take a visit some day…. It doesn’t even serve a purpose for gods sake and we have all seen kids climbing up and jumping from the cliffs and there are plenty among us knowing the dangers who would be looking on just in case. At least there was I believe an acceptable degree of safety where this now as Tony points out cattle pen has been constructed. Also anyone deciding to jump from here at low tide won’t stand much of a chance if they don’t clear far enough as most of us know what lies beneath. Im sure many will disagree but what they have put up is actually really dangerous. There was great caution on that platform before this and on the whole people would look out for others. I think what they have put there is going to encourage more people on the platform kids climbing all over the thing and dare I say an accident because on the whole people will be sucked into feeling safe so they are not going to be as alert as before. Small kids can pass under the thing anyway so its not about safety. Infact if it was about safety I’d sure as hell like to know what research was done because from what I can gather there was zero. Anyone with half a brain could tear apart an argument that it was about safety. The irony of this obtrusive obsticle is that those responsible have lost their connection with the universe. Whether they are aware of it or not their impedimenta is fear and these mindless prison like railings are the result. 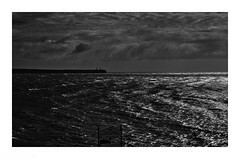 Pitty they didn’t take a leaf out the West Coast of Ireland’s minimalist approach. It’s a bloody eyesore! And the shite concrete they put down was also bloody mindless! And the public toilets well that’s nothing more than sheer bloody laziness! That’s the thing Sam. No-one responsible is visible, no-one responsible understands the ugliness nor even the irony of their actions, that the purpose of the place is to allow people to pursue individual freedom by swimming or diving. I have been a Newtown and Guillamene swimmer for 50 years.Only this morning I first saw the cattle pen on the main platform. The imbecile or imbeciles who thought this up,designed and fitted it ar typical local authority morons with no responsibility or accountability for their actions.They have ruined a beautiful swimming area.My money is on the south east storms or metal thieves to remove this eyesore. A great read and viewpoint. This lovely public amenity has been vandalised by authority. Thanks for highlighting what needs to be said about our precious Guillemene and Tramore Bay. Many may not want to hear but I think that coming from someone with such a devotion and expertise in relation to the sea, you may well be just the person that will get the waters rippling and ultimately splashing. Know you have support! Needed to be said. Only saw the photos last night myself, a disaster. I guess I wouldn’t mind if the railings were stainless steel if they served a purpose well but these will make the Guillamene more dangerous when the young ones start jumping off them. Its good you have pointed out the stewardship of the cove too which I knew about but I didn’t know there was a website and did not know the ins and outs of the upgrade. Its a pity the money couldn’t have been put into the woodland walk instead. Thanks for writing all of this. Since I’m not an N&G committee member I didn’t feel I could figures on it but it’s very significant, many multiple tens of thousands minimum. Versus the cost of opening and closing and occasional maintenance of a public toilet for 3 months?